"A View Of The Past- Vision Of The Future"
Most local histories relate the naming of the town was done through a lottery. The eight original town shareholders submitted suggestions for a name. The name Sauk Centre was selected. The name had been submitted by Alexander Moore, the man who originally bought and platted the town. Sauk referred to the many place names associated with the Sauk tribe (Sauk River, Sauk Rapids, Little Sauk, Osakis etc.) The exact reason for the proliferation of Sauk name places in this area is still being researched as by the time settlement occurred here the land was understood to be Sioux/Dakota land ceded in the Treaty of 1846.<Minnesota and Its People JA Burnquist 1924 p88> Local lore has it that 5 refugees from the Sauk tribe had been killed in an ambush on the shores of Lake Osakis 17 miles away. <https://visitosakis.com/history/> Centre refers to the location of the town centrally located between many native trading paths and next to the Sauk River, essential for transport of trade. In the 1940s, the town lobbied to retain its original British spelling of 'center' as recorded by town founders. Sauk Centre contains the Sinclair Lewis Boyhood Home, a National Historic Landmark, and three other properties listed on the National Register of Historic Places: The Palmer House built in 1901 and expanded in 1916, the Minnesota Home School for Girls built 1911–1935, and the Original Main Street Historic District built 1920–1947. According to the United States Census Bureau, the city has a total area of 4.25 square miles (11.01 km2); 3.99 square miles (10.33 km2) is land and 0.26 square miles (0.67 km2) is water. 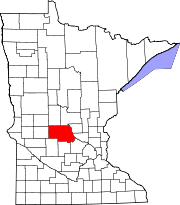 Sauk Centre is located along Interstate 94, U.S. Highway 71, and Minnesota State Highway 28. It is approximately 100 miles northwest of the Minneapolis/Saint Paul metropolitan area. The city is considered to be in the middle of the state. Sauk Lake and Sauk River are the most notable water features of the area. Fairy Lake and Lily Lake are located just outside of the city limits. As of the census of 2010, there were 4,317 people, 1,851 households, and 1,174 families residing in the city. The population density was 1,082.0 inhabitants per square mile (417.8/km2). There were 1,994 housing units at an average density of 499.7 per square mile (192.9/km2). The racial makeup of the city was 95.6% White, 0.8% African American, 0.1% Native American, 0.3% Asian, 2.2% from other races, and 0.9% from two or more races. Hispanic or Latino of any race were 4.4% of the population. There were 1,851 households of which 28.4% had children under the age of 18 living with them, 50.5% were married couples living together, 9.4% had a female householder with no husband present, 3.6% had a male householder with no wife present, and 36.6% were non-families. 32.1% of all households were made up of individuals and 18% had someone living alone who was 65 years of age or older. The average household size was 2.28 and the average family size was 2.86. The median age in the city was 41.4 years. 22.9% of residents were under the age of 18; 8.2% were between the ages of 18 and 24; 22.8% were from 25 to 44; 24.3% were from 45 to 64; and 21.6% were 65 years of age or older. The gender makeup of the city was 47.4% male and 52.6% female. As of the census of 2000, there were 3,930 people, 1,616 households, and 1,042 families residing in the city. The population density was 1,057.2 people per square mile (407.9/km²). There were 1,709 housing units at an average density of 459.7 per square mile (177.4/km²). The racial makeup of the city was 98.68% White, 0.31% African American, 0.13% Native American, 0.25% Asian, 0.25% from other races, and 0.38% from two or more races. Hispanic or Latino of any kind were 0.53% of the population. There were 1,616 households out of which 30.4% had children under the age of 18 living with them, 53.0% were married couples living together, 8.5% had a female householder with no husband present, and 35.5% were non-families. 31.4% of all households were made up of individuals and 17.8% had someone living alone who was 65 years of age or older. The average household size was 2.38 and the average family size was 3.01. In the city, the population was spread out with 25.6% under the age of 18, 8.2% from 18 to 24, 25.1% from 25 to 44, 18.6% from 45 to 64, and 22.5% who were 65 years of age or older. The median age was 39 years. For every 100 females, there were 89.4 males. For every 100 females age 18 and over, there were 85.4 males. The median income for a household in the city was $37,644, and the median income for a family was $47,623. Males had a median income of $33,382 versus $20,399 for females. The per capita income for the city was $18,390. About 2.3% of families and 5.2% of the population were below the poverty line, including 2.9% of those under age 18 and 8.0% of those age 65 or over. There are two schools in the town: Holy Family and Sauk Centre Public School. Holy Family is a Catholic private school; it enrolls students from kindergarten to 6th grade. Sauk Centre Public School has 2 departments: Elementary (kindergarten to 6th grade) and Secondary school (7th to 12th grade). Students in the school are also called Main Streeters, or Streeters, which comes from the novel Main Street by Sinclair Lewis. A violent local incident in 1996, where the elderly Paul Crawford shot and killed four members of the neighboring Schloegl family over a property dispute, was featured in the episode "Lake of Madness" on the Investigation Discovery series Fear Thy Neighbor. The episode aired on April 20, 2015. ^ "Minnesota National Register Properties Database". Minnesota Historical Society. 2009. Retrieved 2018-06-12. ^ "CNS NEWS BRIEFS Apr-4-2013". catholicnews.com. Wikimedia Commons has media related to Sauk Centre, Minnesota.